NextGen Gaming was founded in 1999, just in time to join the online gambling revolution that has changed the way we have placed our bets and played casino games forever. Since then this online gaming developer has won awards and established itself as a premium gaming provider. Living up to its reputation, NextGen games use the latest graphical technology and gameplay innovation that has attracted a world-wide fan base of players. 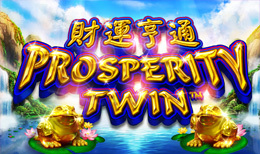 Step inside a beautiful, Chinese-inspired universe, filled with bonuses and modern game play, Prosperity Twin is an online slot game that will please not only your eyes but your wallets too. It has 5 reels, 3 rows and 243 paylines and takes place in the Chinese version of heaven. You will be transported to a land of high-peaked mountains, fluffy white clouds and tranquil waterfalls. The wooden reels are floating serenely over a lake surrounded by pierced coins and golden frogs which are traditional symbols of luck in Chinese culture. The game is called Prosperity Twin because you have the option of playing from left to right or both ways. If you activate the two-way function, you can match the identical symbols on the adjacent reels from left to right and right to left. In addition to this you also have a beautiful array of Oriental symbols on the reels. You have the traditional card playing symbols which include the four suits of diamonds, spades, clubs and hearts. While these symbols are the most common, the number 8 will give you a bit more of a cash reward because the number is lucky in Chinese culture. The other symbols are also rich in Chinese symbolism: a golden carp, a necklace, a golden crown, an abacus, a pot of gold and a sail ship. The most prosperous symbols are the bonus symbols. The Lucky Coins symbol is your Wild and it will replace any other symbol except for the Wreath Hieroglyph which is the Scatter. The Lucky Coins are Stacked Wilds, which increases your chances to complete more winning combinations. In addition to this they also come with multiplier prizes, depending on the combination you could receive a reward of 2x or 8x your stake. The Wreath Hieroglyph symbol is your Scatter and it will certainly bring you luck. 3 or more of these Scatter symbols anywhere on the reels will bring you wins. The Scatters trigger the Free Spins feature, as soon as you land 3, 4 or 5 Wreath Hieroglyphs you will activate 8, 18 or 28 free spins! During the Free Spins feature, if you land 2 Wreath Hieroglyphs anywhere on the reels you will be rewarded with 2, 6 or 8 additional free spins. Chinese traditions pay considerable attention to what will attract luck and fortune, all of which you can find in this online slot game from NextGen Gaming. The Oriental theme is done with brightly coloured graphics, full of vibrancy and energy as you search for those lucky symbols which will trigger free spins and multipliers. If you enjoyed Prosperity Twin you might also like Pyscho.